Great music penetrates the soul of the listener and gives the person a hint of the splendor and beauty of God. Music heals and uplifts the human spirit and at its best can help transform the listener and the performer into signs of redemption on earth. When Gabriel announced the good news to Mary that she would become the mother of the savior, a new era for humanity was ushered in. The scene of the annunciation is perhaps the most painted in history. It has also has inspired countless composers throughout the ages to set the words of Gabriel and humanity’s longing for the prayers of mother of God to music. 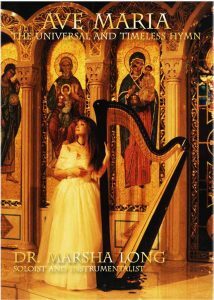 Dr. Marsha Long is one such composer and performer. 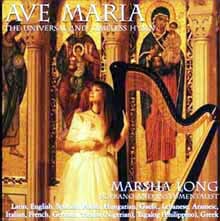 She approached Alba House with a vision for a music CD that would capture the universality of Mary’s appeal by singing in fourteen languages. She would demonstrate the timeless quality of Gabriel’s words by performing in styles as diverse as ancient chant and contemporary pop. She would arrange the classic versions of the Ave Maria in such a fashion as to invite the listener to have a renewed faith in angels and Mary’s maternal love for us now and at the hour of our deaths. 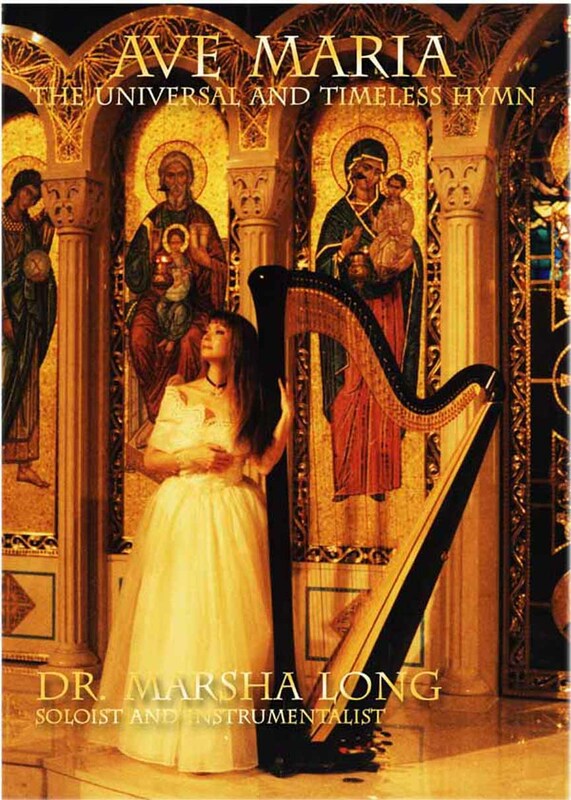 Dr. Marsha Long holds two master degrees and a doctorate in musical arts from Juilliard. 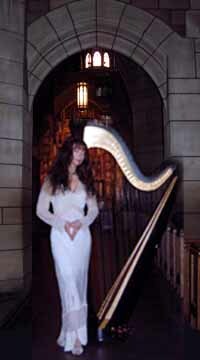 She has performed all over the world in cathedrals and concert halls. This CD is a testimony to her enormous talents, her pursuit of perfection, and her faith in Mary the Mother of God. Here are the bare facts about the CD. 1) It is 75 minutes long. 2) Dr. Long sings in 14 languages. 3) She plays 16 instruments on the album. 4) She composed eleven original pieces and arranged all of the classical works. 5) She sings in four octaves on the album. These bare facts cannot capture the impact of this album that was conceived in loved, forged in hard work and launched with prayer. From the beginning of the project Dr. Long and Alba House wanted to produce a CD worthy of the subject matter being performed. Dr. Long picked the best locations, studios, and instruments for the CD. The artist and Alba House wanted this CD to as close to perfection as possible. We recorded the pipe organs of St. John the Divine in New York City, New York University and St. Columba Cathedral in Youngstown. Three different Steinway pianos, four types of harp, a variety of exotic and folk instruments were all carefully chosen by the artist to produce incredibly beautiful and at times exotic sounds. The most important instrument on the album, however, is Dr. Long’s voice that covers four octaves. This album is a combination of location recording at cathedrals, concert halls, universities and sound studios. The American Pop Ave was recorded at the world famous, “Hit Factory” in New York where all of the pop stars to their best work. The mixing and a great deal of the vocals were done at the state of the art “Mars Studio” just outside of Cleveland, Ohio. The final mastering of the CD was done in New York by the Grammy award-winning engineer Ken Robertson. Every track on the CD has its own unique story. A number of years ago, Dr. Long was the music minister at a mass where a Nigerian Priest was celebrating his 25th anniversary as a priest. As a post-communion hymn she sang in Yoruba the Hail Mary set to Schubert’s Ave Maria. The priest was so moved and surprise he broke down in tears. For this CD, she composed an original Ave Maria in Yoruba and used tradition African instruments for the performance. She plays on it the “Talking Drum”, the only drum capable of playing musical notes, and the African Xylophone. The “Talking Drum” is capable of sending messages by sound and hence its name. She learned how to “send” the “Hail Mary” on the talking drum. When Nigerian Jesuit priest Richard Omaladi heard the CD he was amazed. He loved the CD as a whole and especially Dr. Long’s “superb mastery of the complexity of the talking drum, her clear pronunciation of Yoruba and her overall inspiring performance.” While traveling through Hungary, Dr. Long developed a love for the traditional instruments she heard played there. For the Hungarian Ave she wanted to us a Hungarian instrument called a cimbalom. Although she appreciates and is expert at using synthesizers to produce wonderful music, as much as possible she wanted to use instruments from the various countries she composed the pieces for. Finding a cimbalom proved difficult, all of her leads pointed to an elusive Gypsy called Cosmo. She tracked him down to the Bronx and he referred her to dealer in exotic and rare instruments. 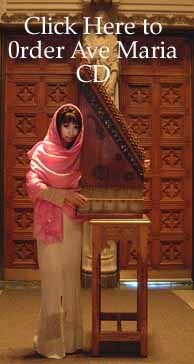 She purchased and restored an antique cimbalom, which gave her exactly the sound she was looking for. People from the various ethnic groups that hear their own language being so skillfully utilized are delighted with the CD and at the same time learn to appreciate the music traditions and languages of other groups that are very different from their own. Dr. Long sings in Latin, English, Spanish, Polish, French, German, Italian, Lebanese, Aramaic, Gaelic, Yoruba, Tagalog (Filipino), Hungarian, and Greek. There is no need for translations because all the songs capture the sentiment of an angel’s respect for Mary and Mary’s desire to pray for us now and at the hour of our deaths. This CD takes the listener not only on a musical journey around the globe but also a great pilgrimage through time. The Greek piece simply takes the words of Gabriel in Luke and puts them to music. She ends it with an alleluia from the Orthodox liturgies for feast of Mary. She sings a Latin Ave in the standard medieval Gregorian chant, a moving Ave by Caccini from the renaissance, the Bach/Gounod Ave from the classic tradition, the Schubert, Verdi, Puccini, Mascagni, pieces from the Romantic period, and numerous original pieces in the contemporary folk and pop styles of our own age. In New York City where Dr. Long has led liturgies in countless churches, the Mass is celebrated every Sunday in 50 languages. This is a sign of the depth and breath of the intermingling of peoples in that great city and the importance of being Catholic in every sense of the word. Besides playing, singing and leading choirs at individual churches she has also been a frequent guest on the Prayer Channel in the Diocese of Brooklyn that goes out to 800,000 homes. At Alba House we had a three fold apostolic wish for the CD. First we wanted it to reinforce build up and reinforce those already devoted to Mary. Second, we wanted to rekindle the devotion to Mary in those who may have lost their affection for the Virgin, Mother of God. Third, we wanted this CD to inspire those who appreciate great music but have no particular religious faith to have their curiosity aroused by the music to look into the faith that inspired such compositions. I believe the album has definitely achieved our first goal. Numerous women from altar and rosary societies and men from a variety of prayer groups have attested to how much the CD has moved and inspired them. Benedict Groeshel on receiving a copy of the CD immediately understood our intent for the project. He said “as background music this CD is an excellent help for prayer and meditation.” One diocesan priest who constantly plays the CD in his car stated, “Whenever the Gregorian chant Ave plays, I am immediately transported back to my seminary days and feel refreshed and restored.” Numerous priests and religious have had similar experiences and in some there has been a rekindling of devotions that for too many years have been dormant and are now once again awakened. Our second goal is already being achieved. The third goal of the CD is to reach out to people beyond the Church. General and even “new age” stores are beginning to carry the CD. Cantor Richard Botton, Cantor Emeritus of the Central Synagogue in New York City, on hearing the CD wrote, “Marsha Long is an extraordinary talent. She is proficient in playing the organ, the harp, as well as other instruments, and she possesses a beautiful soprano voice. She uses that extraordinary instrument to sing with great charm, passion and spirit. She is an extremely gifted performer.” Cantor Botton has not only been an inspirational singer in the synagogues of New York but also a performer at the Metropolitan opera. He understands the importance of great music in nurturing the human soul. He respects wonderful music from whatever religious faith it arises from. I know several cancer patients who find the CD particularly comforting. This was always one of the artist’s desires for the CD. As an organist in a Church next to Sloan Kettering in New York, Dr. Long played preludes before mass for numerous visitors to that healing institution. 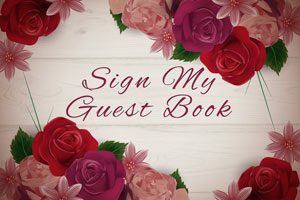 She expanded her repertoire of languages in order to serve the diversity of the people that constantly came to the church to be comforted and strengthened as they faced the serious illnesses of their loved ones. The tranquility and the joy of the music on the CD have already had a healing effect on a wide variety of people. One three year old, who lost her mother in the September 11th tragedy listens to the CD often and dances to the “American Pop Ave.” An owner of a music studio calms his two children down as he puts them to be by having them listen to Schubert’s Ave Maria. Though the classic pieces by Schubert, Mascagni, Puccini, Verdi, Bach/Gounod, Bottazzo, Caccini, and Arcadelt may appeal primarily to more mature listeners even the youngest person can be stirred by the sounds composed by these great artists. This is especially true when their music is arranged and interpreted by a singer and composer like Marsha Long. However, CD touches something deep and numinous in the young and old alike. It was one of the few CDs that were played in the World Trade Exhibition Hall in Toronto for World Youth Day. The CD can be used to enhance private prayer and para-liturgies. A person can play one of the Ave Marias before saying the rosary or a different Ave between each decade. It can also be played softly in the background as the person prays through the mysteries. The CD can be used to put groups in a prayerful and reflective mood. Often we bring such inner turmoil to our prayer life that we are unable to unleash the joy that should come from addressing God and listening for the voice of our Creator. Frequently, we forget that we are always held in the mind and heart of Christ and that the angels and saints are walking with us on our journey back to God. Playing one of the tracks from this CD in a Church at night lighted by candles makes the listeners aware of the closeness of the Mother of the Church who is watching over her children and wants us to delight in our discipleship with her son. How successful the CD will be in reaching people will depend on our ability to market and spread the word about this remarkable achievement. Our main goal now is to get this CD into as many homes as possible. Numerous parishes have sold and distributed this CD to raise funds for themselves and to build up the faith of the people in the parishes through the use of beautiful music. Also it is being offered to various religious congregations for their fund raising efforts. When the Church as a whole supports the arts, our faith becomes more attractive and the beauty of God in this world more respected. This is our ultimate hope for this CD. That it will uplift human emotions, open minds, and stir the souls of the listeners.